miniature based on Probert’s design. This production print of the original sketch by Mr. Probert was created on February 28, 1979. 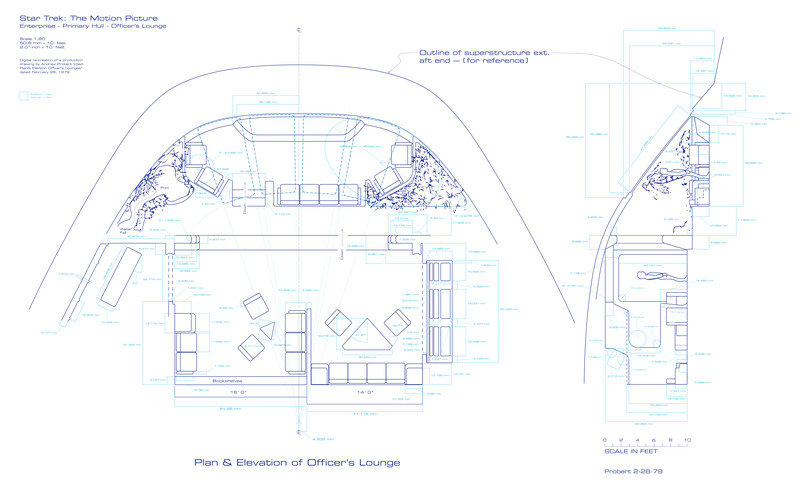 It was the “final” design of the Officer’s Lounge that was approved and was moved into production. From this sketch—the original blueline drawings of both the plan and elevations of—were made by Leslie Ekker on May 7, 1979. 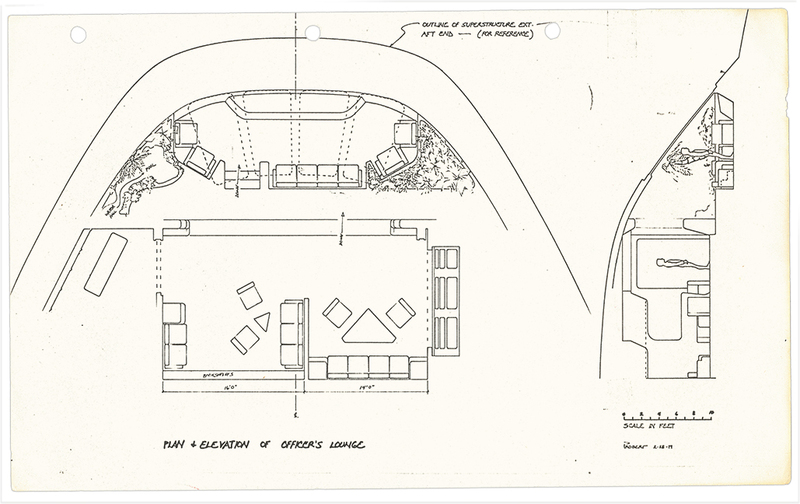 It was deduced that those bluelines were then used to produce the miniature set, which was used for the couple of SFX shots in the film where you are inside the lounge looking out of the aft windows as Spock’s long-range Vulcan shuttle moves to dock with the Bridge docking ports above the lounge. This print of the Probert plan and elevation sketch was acquired from an online seller who originally purchased it through Hollywood Relics. within the Bridge/2-3 Deck superstructure. As before, the original scan was done at 600 pixels per inch (PPI) which is overkill, and so I will not be publishing that one here on my blog. That said if for some reason anyone wants to get a hold of the full 600 PPI image, I would be open to doing so by request. Again I took the scan and brought it into Adobe Illustrator to digitally “redrew” it, cleaning up and making the lines consistent, perfectly straight—where the lines were of course intended to be straight—and cleaned up some of the slop in the drawing. the final blueline drawings and miniature were based. It is a layered PDF meaning there are different image layers that can be turned on or off. For this particular one, I have two different versions of the drawing within the PDF. The first is done to the size of the drawing itself. Using the 16′ dimension stated in the drawing itself for width of the seating area on the left-hand side of the lounge which when measured that precisely, we can mathematically work it out to be roughly 1:76 scale (or 1:76.2107171320967 to be precise). Which yields a scale of 39.994375 mm = 10 ‘ feet. There are several sets of layers within it. The artwork layer, derived dimensions, the decorative foliage, the human figures in the original drawing, etc. They are listed with a label suffix saying “1:76 scale” for the layers that match the sizing in the original drawing. I have also scaled all of that up by 127.018% to make it 1:60 scale, which is double the scale of the filming model, which was built at 1:120 scale. So there are a set of layers with the artwork, derived dimensions, etc. all at that scale and are listed with the label “1:60 scale” within the PDF. With this done, I hope to now go back and re-work/finish up the Ekker productions drawing I started a couple of months ago. I halted that to work on these earlier productions, since these will help inform some of the detail aspects of the digital redrawing of the Ekker drawing(s). They will definitely impact subsequent work when bringing those into the 3D modeling software and working out the overall placement and fit within the Bridge/2-3 Deck superstructure. This entry was posted in Project Enterprise, Projects and tagged 2-3 Deck, Andrew Probert, B/C deck, blueprints, concept art, Leslie Ekker, Officer's Lounge, production sketch. Bookmark the permalink.